Peer pressure affects everyone. We all want to fit in and be accepted by the people around us. The pressure to be accepted by friends and classmates is even stronger for preteens and high school aged young people. This retreat deals with the stresses young people may face as they try to find their place among their peers. It will also equip them with some useful scripture tools to handle peer pressure in a productive way and avoid the pitfalls that come with giving in to peer pressure. Whether we realize it or not, everything in our lives impacts and shapes who we are. In much the same way that a piece of iron is used to sharpen an iron blade, the people we “bump into” on a regular basis have a profound effect on our lives and character. Use this scripture to help young people understand that even though they may now see it outwardly, the friends they associate with can affect their behaviors. It’s important to surround ourselves with a strong base of godly friends who can offer support and help keep us on the right path. That’s not to say we can’t associate with people who are not believers. However, it’s important to make sure that we’re influencing them for good rather than the other way around. Avoiding the “wrong kinds of friends” is a key step in staying out of the reach of negative peer pressure. However, in today’s society it’s nearly impossible to avoid people of questionable morals. Every day young people come in contact with scores of peers in the classroom, after-school activities and especially online who do not have the same belief system or biblical background. Should they shun these people entirely? Of course not. However, there is danger in associating too closely with some people. Teach your young people using the scripture from 1 Corinthians that it’s important to be aware of the pressures these kinds of friends may put on them. It’s okay to be friendly and kind, but if their friends begin trying to get them to do things that go against what they know is right, it may be time to take a step back from that particular friend. 10 My son, if sinners entice you, don’t be persuaded. “Just Say No” was the motto and battle cry for the war on drugs during the 1980s. It’s simple and gets right to the point. The scripture from Proverbs is another to use in teaching young people how to deal with peer pressure. Friends will try to get them to do things they know are wrong. They may attempt to convince them that it’s “no big deal” to take part in a sinful or even dangerous activity. It may be difficult to go against the culture when all we want is to fit in. However, it’s necessary for believers to offer up a simple “no” when we are tempted by our peers to do things that go against our beliefs. Everyone loves a cool t-shirt. And what’s cooler than a shirt with a custom design? This craft is fun and creative, but also potentially messy, so be warned. Supply white t-shirts and allow the attendees to draw their own unique designs on them. Trace over the designs with Elmer’s Blue School Glue. After allowing the glue to dry, put the shirts into the dye. Once dyed, the glue can be peeled or washed off, leaving the white design behind. Explain to the attendees that rather than allowing the sinfulness of the world and society around us leave its ugly mark on our lives, we should strive to leave an imprint of Christ’s love on our friends and peers. Parents are a vital part of helping preteens and teens cope with peer pressure. However, sometimes young people are hesitant to open up to their parents about what they’re dealing with for fear of being ridiculed or reprimanded. Creating a personalized safe journal is a great way to open up communication with young people and parents. Supply plain composition notebooks and plenty of markers, stickers, washi tape and other fun items for the attendees to use to decorate their journals. Make sure they understand that this is not a diary to keep to themselves, but a journal to share with their parents without judgment. Be sure to explain to parents that this tool is to be used with an open mind and an open heart. The things written in the journal are not to be harshly judged and must never be shared outside the home. This is a great craft to use as a “cool down” as it requires steady focus. Provide sheets of paper in several different colors. Use the templates and instructions to guide the young people through the folding process. Take the opportunity to explain that diamonds are created when great pressure is placed on atoms of carbon, causing them to fuse together. Pressure has the potential to break us, but with God’s strength, we can be made into something beautiful! This fun ice-breaker game is all about listening carefully and thinking before acting. To play, gather your group into a circle. For the first round, the participants will repeat and do exactly as you say. If you give the command to “Jump In” they will answer “Jump In” while jumping into the circle. For round 2, they will do the opposite of what you say. If you give the command to “Jump Left,” they will answer with “Jump Right” while jumping to the right. For round three, they will say what you say, but they will do the opposite of what you command. If you give the command to “Jump Out” they will answer “Jump Out” but they will jump in. For this game you will need a length of rope with knots tied in it several feet apart. Station the attendees between the knots into the rope and tell them to hold onto the rope with one hand. Explain to them that the rope is their lifeline and they cannot let go of it. The knots represent times in their lives when they may have to deal with peer pressure. As a group, they must untie all of the knots. They can use the hand not on the rope and they can talk to each other and move around, but they cannot let go of the rope. Allow them to work together and explain how important is for friends to be there for one another to pray for one another and offer support during difficult times of peer pressure. A mainstay at youth camps and Bible study groups, this is a fun game to use to get your young people interacting with one another. Have your group stand in a circle. Begin by saying “Never have I ever”: wrecked a bicycle, had a cavity, been to Disney World, etc. Anyone who HAS done what you say must sit down and is out of the game. The next person says “Never have I ever _____” and the play continues. The last person standing wins. This cool object lesson (with a bit of science thrown in) can help young people see the importance of not letting peer pressure be the guiding force in their lives. Place a balloon inside a clear plastic bottle, making sure to leave the end of the balloon hanging out of the mouth of the bottle. Instruct a volunteer to blow up the balloon inside the bottle. They will be unable to do so. Explain how the negative pressure around us can keep us from living up to our full potential. This scavenger hunt has an interesting twist! Set up the course with peer pressure scenarios in different locations all over the room or building. Each scenario is either positive or negative. A right answer will lead to the next scenario, but a wrong answer will send the team or individual back to the beginning of the course. The first person or team to finish wins. Peer pressure can influence anyone, regardless of age. It’s especially difficult for teens who are struggling to fit in and find and keep friends and status. 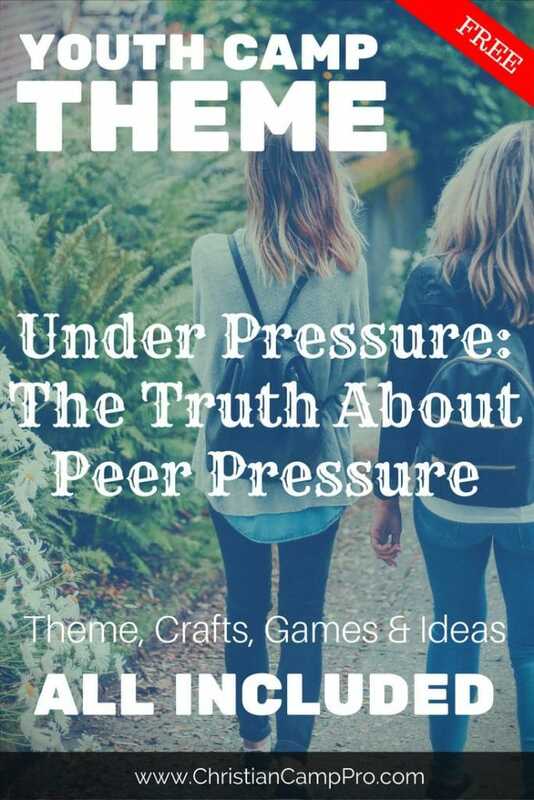 A retreat devoted to exploring peer pressure can help young people identify and stand against the pressures placed on them by their friends and peers.